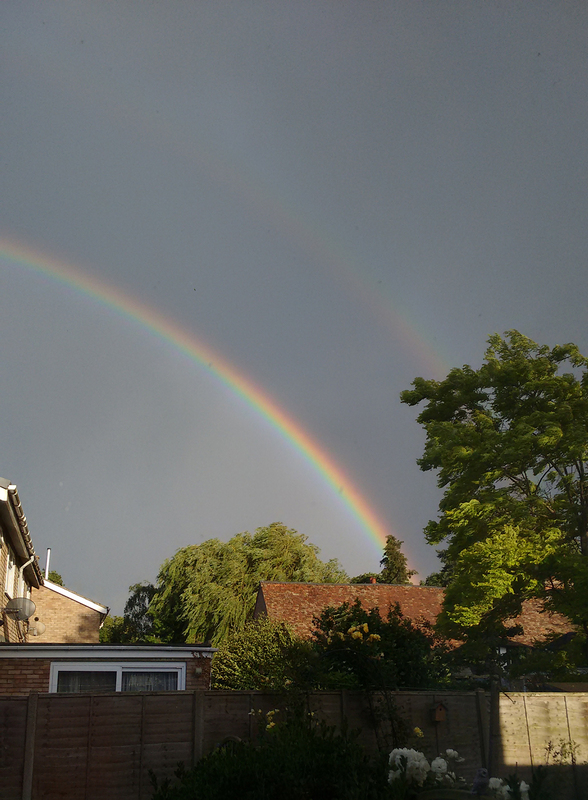 If there is one thing that continues to delight me about living in the United Kingdom, it’s that there are a metric crapton of rainbows. And it doesn’t matter how many there are, because each one makes me jump up and take pictures and make happy noises. Realising this one was a double, of course, way notched up the excitement. We had a measly singleton two days ago and no rain, while today has been all the rain and gusting, and then rainbows. And now it’s all clear again, ha ha. What can I say, the Texan and the Brit in me both love weather more than is probably reasonable. For now, I’ve got Batman (one of our cats) sitting on the back of my chair being weird, so I should probably pay attention to him.